While payment systems like cash and credit and debit cards still dominate the payment landscape, the latest trend among retailers is mobile payment. A mobile payment app lets you send money from your phone, either to other people or to a payment terminal to buy something in a store. There are lots of options these days for mobile payment, and more solutions are coming out all the time, both from businesses you've heard of and others from startups. Either way, you can definitely find something that works best for you, whether you're looking for a secure person-to-person payment app or something that you can take with you to the store so you don't have to pull out your card when it's time to pay. Anonymous single-use token system doesn't transmit credit card info. Compatible with broad range of major banks and credit cards. Can be used only with recent iPhone and iPad models. Peer-to-peer transfers only available for friends with iOS devices. Apple's iOS platform integrates with Apple Pay, a service that stores credit cards, debit cards, coupons, and online passes. Add a card to Apple Pay to tap-to-pay at millions of retail locations internationally. Also included with Apple Pay is Apple Pay Cash, which is a way for you to store money on your phone in a virtual card. You can spend it through Apple Pay in stores or use it in the Messages app to pay or receive money through a text message. The Apple Pay service is secured with a PIN or with Apple's TouchID or FaceID biometric systems. Google Pay Send App (iPhone). Supported at many retail websites, physical locations, and in other apps. User base smaller than its competitors. Receipt of sent money varies from seconds to days. There are two ways to pay for things with Google. Both of them are 100 percent free to use, but they're built for different reasons. The first way to use Google to pay for something is with the Google Pay app (previously called Android Pay and Pay with Google) which can be used in stores, through apps, and online to buy things. It's tightly integrated with the Android ecosystem, so it's pretty easy to use anywhere you buy something from your Android. The other Google Pay payment option is called Google Pay Send (the new Google Wallet) which is for sending and receiving money from other people. It can be set up to automatically to put incoming money into your bank or to have it stay in your Google account. Works at any location that accepts credit cards. Has largest user base of similar apps. Scans and saves any card with a barcode. Earns points with every purchase. Uses older magnetic stripe technology. Installed automatically on some Samsung phones. Samsung Pay supports the enrollment of credit, debit, gift cards, and membership cards to facilitate in-person, in-app, or online payments. The app also features special promotions. Because Samsung Pay uses two wireless technologies at once, MST and NFC, the app will use whichever one is supported by the terminal when it's time to pay. This takes the guess work out of it for you and eliminates any steps you'd have to take to turn one or the other radio on. Familiar mobile payment option trusted by consumers. Accepted by most online shopping sites. a mobile payment with PayPal is easy and convenient, plus there are several security measures in place to prevent theft. All you need to do to pay with PayPal is link your PayPal account with your phone, set up a PIN, and then complete checkout at a related payment terminal. PayPal is also ideal for sending money to other users all around the world because it's one of the most popular payment services around, so chances are many people you know already use it. There are minimal fees associated with some payments, but in most cases PayPal can be used absolutely free of charge to send or receive money. Another neat feature about PayPal is that you can create what are called Money Pools to set up a way for people to pitch in to send you money. The pool page is public for anyone to see and contribute to. Proprietary $Cashtags protect user privacy. Cash is a money-sending app from the company Square. It's very simple but also very reliable, secure, and easy to use. When money gets set to you through Cash, it can be stored in your account and transferred to your bank whenever you want, for free. The Cash app is also tied to a real debit card that you can get from the company for free. With it, you can spend money directly from your Cash account like any debit card. Similar to PayPal's Money Pool, Cash uses Cash.me pages that make it extremely easy for people to pay you without needing your personal information. These are real web pages that anyone can visit to pay you; they're linked to your $Cashtag. Designed for use with people you trust. Social component solicits comments on transactions from friend and family. Recipients must install the app. Transaction descriptions open to public or semipublic scrutiny. Venmo is a pay-by-text service, which enables people to pay one another using its SMS-based approach. This system puts a maximum payment limit of $299 per week until your identity is verified; then the weekly limit rises to $2,999. Single transactions are limited to $2,000, and there is a limit of 30 transactions per day. Payees get a text message about the amount they have been sent, and they will have to register themselves in order to retrieve the sent funds. Earns Starbucks points for each $1 spent. Free in-store refills on coffee and tea. Useful only at Starbucks locations. Points can't be redeemed on alcoholic beverages. 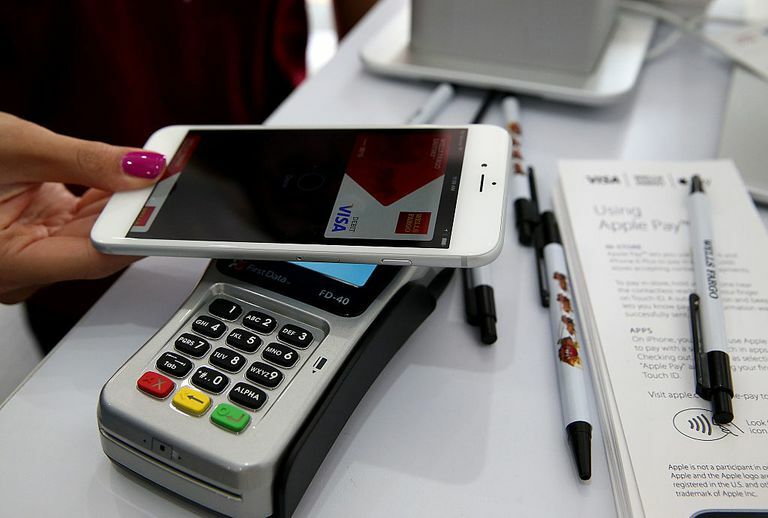 One of the most popular mobile-payment apps is not considered a banking app by most experts. The Starbucks app boasts more users in 2018 than Apple Pay, Samsung Pay or Google Pay. Use the Starbucks app to order online, but you can also connect a debit or credit card to your app and pay at the Starbucks register with the app. Simple interface: Send, Request, Split. Banks of both sender and recipient must be partnered with Zelle for best service. No usage in retail stores or online. Unlike other services that offer a dedicated mobile app, Zelle works best when paired directly with banks to support person-to-person micropayments. If your bank participates, you can use the bank's native app to transfer money to friends and family using Zelle's infrastructure. What makes Zelle unique is that money can be transferred from one bank to another in (usually) minutes. This is definitely something some people prefer so that the money can be in the account, and totally usable, the same day the transfer takes place. Setting up Zelle if your bank isn't supported yet, is as easy as entering your debit card number into the Zelle app and choosing to send or receive money from that bank. How Does Google Pay Stack Up Against Samsung Pay and Apple Pay? Samsung Pay vs. Google Pay: Which One is Better? Did You Know You Can Pay with PayPal in Offline Stores? What Are Some Advantages for Small Businesses Using Mobile Payments?